Busy at work, no time to write blog posts. Things are calming down, so… I’m back in action! I have been eating during this time though. I received the Nigella Kitchen cookbook for my birthday three months ago from my lovely mum, and have been busy attempting some of the recipes within it. And I’m pretty impressed with how they’ve all turned out so far! The stunning success of these three means that I’ll definitely be trying out some more, just as soon as I have some time. I was a bit distracted while I was making these and completely forgot to put the two stipulated eggs in the mix. Worked out well, because a friend came over who doesn’t eat eggs, and she was able to scoff one down! I’m not sure if it worked out so well because I had an old banana lying on the bench and mashed that up and incorporated it in the wet ingredients. Perhaps the banana substituted for the eggs? This involved a day of marinating chicken thighs (Nigella says breast is best for this recipe, but I had thighs) before baking in a hot oven. Unfortunately this does mean a bit of pre-planning as you can’t just bash this one out for a quick dinner. However, all the ingredients for the marinade I already had* (when can you ever say that!) and the house smelled AMAZING while the chicken was baking. 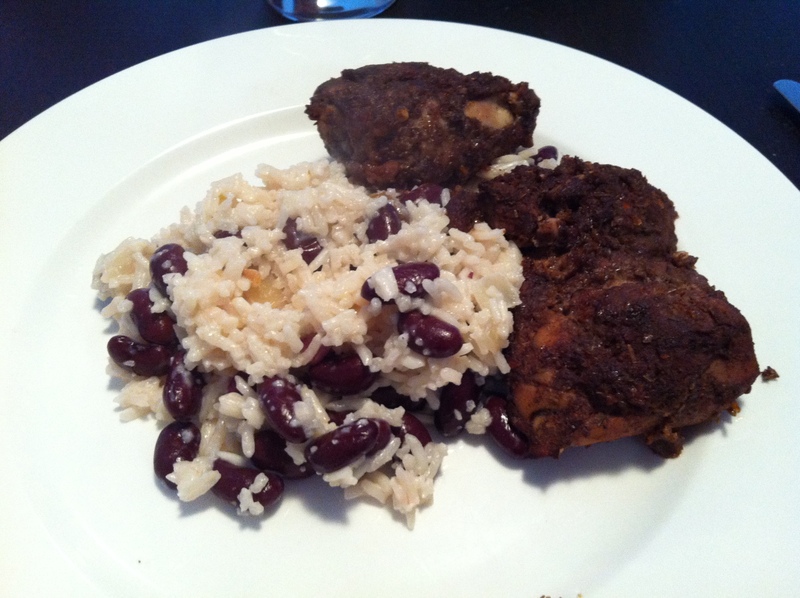 The coconut rice and beans (I used kidney, Nigella says go to your local Jamaican providore and pick up some uber-specific variety of bean but I went to my local pantry instead) were bland and a nice foil to the fiery chicken. Next time I make it, I will put a bit more cayenne pepper in the marinade – I was a little hesitant as I was halving her quantities, but I think you could get away with even more heat in this. The third and last recipe I have tried so far is a more French inspired dish which I had to buy basically everything for (cream, beans, fresh and dried tarragon…). Now I have dried tarragon in my cupboard I’d better start thinking of more things to do with it! 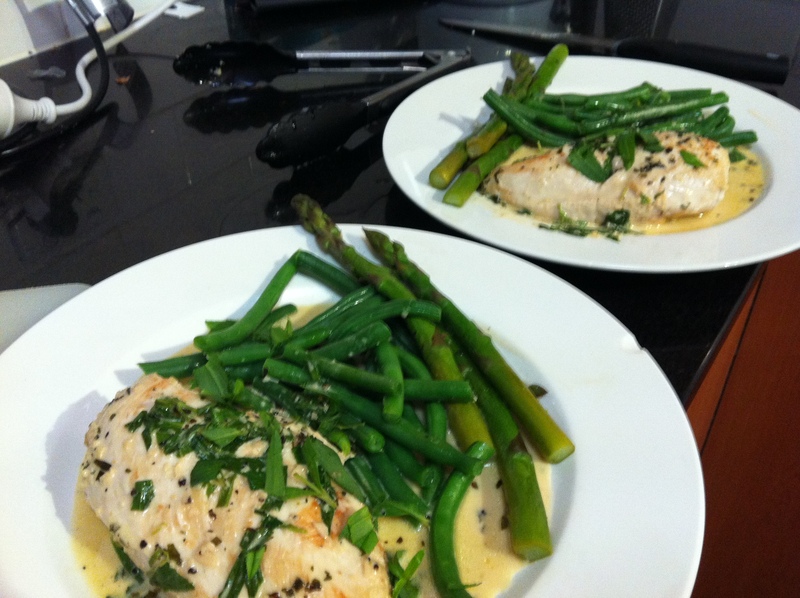 The dish comprises chicken breasts in a creamy tarragon-flecked vermouth sauce which is baked in the oven after an initial browning so it stays super tender. Nigella suggested green beans for the side (and I love green beans) so I followed suit, but also whacked on some aspargus. Dee-lish! Next time I would also mash some potato or serve with rice to soak up the sauce, because as Mr B pointed out, “green beans and asparagus aren’t exactly absorbent”. The touch of cream in the sauce is something I don’t normally add (you add a tablespoon or two to the pan juices after the chicken has finished cooking) but it really makes the sauce very, very nice. This may be a dangerous trend… (Cat starts experimenting with creamy sauces and gains 10kg). 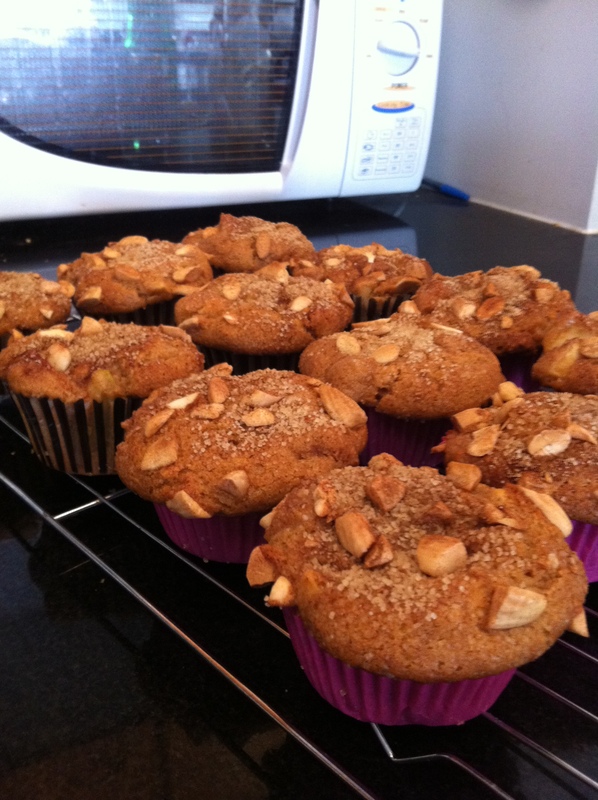 Tags: apple and cinnamon muffins, jerk chicken, nigella, nigella kitchen, tarragon chicken. Bookmark the permalink. I love her too – and Jamie, I’m getting back into Jamie as well. Not sure how well I can replicate 15 minute meals though, given I struggled with 30 minutes…!